A SHATTERER HAS COME UPON YOU! In this dream I saw and heard a vase shattering, the sound of which was so loud it woke me. 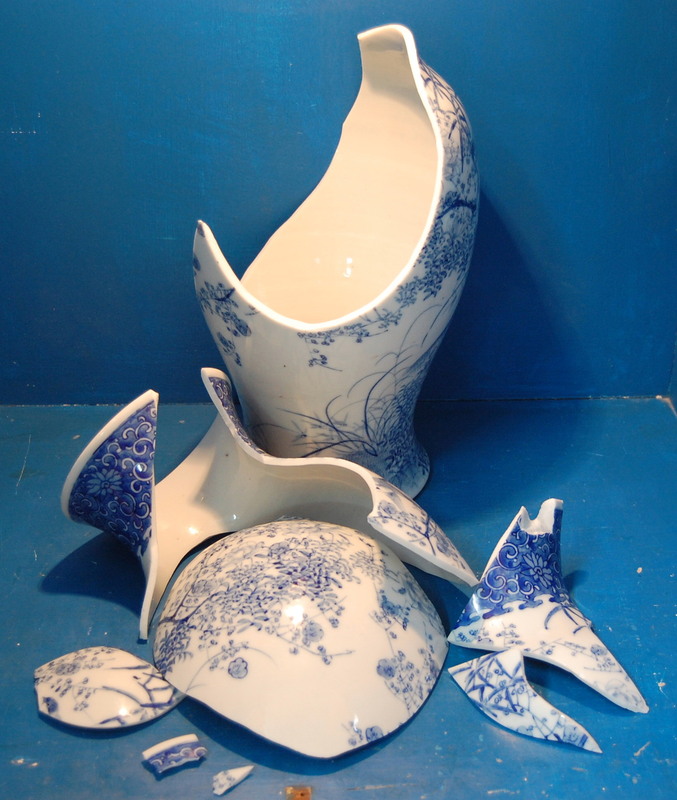 Immediately I got up and ran to my living room to see if my favorite ceramic vase was lying on the floor in pieces. It wasn’t. That’s when I realized the dream was from God, so I waited on Him for awhile to see if He would tell me the meaning, but He didn’t, so I went back to sleep. Upon awakening the next morning I heard this Scripture: “Now the weight of gold that came to Solomon in one year was six-hundred, sixty, and six talents.” – 2 Chronicles 9:16. This numerical sequence, often rendered as just 666, in the oldest Greek manuscripts is rendered as three Greek letters, chi, xi, and stigma, which have the numerical values of 600, 60, and 6, in that order. Most would agree this number is a reference to “apostasy” and/or to an“antichrist” spirit that influences men to rebel against Yehovah and His truth. In the “end of days,” also called the End Times or Last Days, this spirit of antichrist and apostasy will be most prevalent and manifest in great violence and upheaval worldwide, according to Biblical prophecy. Jesus, Paul and other disciples wrote and taught about a “spirit of antichrist” and “a spirit of iniquity,” which were already at work in the fledgling Church [2 Peter 2:1-22; Gal 1:7, 2 Cor 11:13&14]. Apostates are those who ‘turn away’ from worshiping Yehovah the true God, to worship and serve pagan (foreign) gods [2 Tim 4:4, Titus 1:14]. King Solomon is a clear cut example of an apostate, one who knew Yehovah but ‘fell away’ [Heb 6:4-6;1 Tim 4:1] from Him to worship “foreign gods” [1 Kings 11:4-11]. Here are the only other references to the number 666 in the Bible – Ezr 2:13 The children of Adonikam, six hundred sixty and six. 1Ki 10:14 Now the weight of gold that came to Solomon in one year was six hundred threescore and six talents of gold. Rev 13:18 Here is wisdom. He that hath understanding, let him count the number of the beast; for it is the number of a man: and his number is Six hundred and sixty and six. I believe the End Time “strong delusion”  is when men are fooled into believing that the Antichrist IS Christ, not realizing that he’s a NEPHILIM, a hybrid mixture of human and angelic flesh. Also, part of the strong delusion will be that ALIENS (demons really) seeded Mankind and will return in spaceships to save the human race – a current theme in most media outlets . The AntiChrist will be a NEPHILIM who will cause unregenerate men to worship a false god. All who take the name, number or mark of the Beast, will be eternally damned with him. There can be no repentance after giving your allegiance to the Beast. As for King Solomon, also associated with the number 666, maybe the AntiChrist will be a resurrected Solomon via cloning, or be like him in some way (wise, wealthy?) – Today, researchers suppose that the Number of the Beast may be somehow connected with the genetic code indicated in figures. The number 666 may be the sequence of DNA genetic signals or DNA fragments necessary for successful cloning . Modern science can extract DNA from dead animals and CLONE them from it – But if this were ever to happen to a human being, few people would consider that the deceased person had been raised from the dead as a result of having a living clone . This is conjecture, but it might be possible via cloning, to make it look like Solomon (or someone else) came back to life, or ‘arose from the dead,’ thus imitating the resurrection of Jesus Christ. Satan has always wanted to be like the Most High , but will fall short in every way, at every attempt. Re the “beast” – I’m not convinced the beast is either an individual or a nation, I think it could be both [Rev 11:7; 13:1-4 & 11-18; 14:9-11; 15:2, 16:2-13; 17:3-17; 19:19&20; 20:4&10]. Some believe the Beast is just another title for the Antichrist. Re the “antichrist” – he who denies that Jesus Christ has come in the flesh is an antichrist [1 John 2:18 & 22, 1 Jn 4:3, & 2 Jn 1:7]. As to whether antichrist is a single individual, the pronoun “the” doesn’t precede the term in most references. He’s PRESUMED to be an individual from terms like “son of perdition,” “man of sin,” “the prince that shall come” [Daniel 8:11, 9:26] and “that wicked” [2 Thessalonians 2:8-12]. It is believed that one man in the future will become possessed by Satan and become The Antichrist, the Son of Perdition, the Prince to Come, and the Man of Sin, respectively. INTERPRETATION of the Dream: A shatterer was coming upon me, or possibly the United States of America, or both, and I should be watchful and get ready for it. PARTIAL FULFILLMENT of the dream: I believe it was the terrorist attack on the Twin Towers in New York City and the Pentagon three years later on September 11, 2001. Afterwards, I realized the dream was a warning of that tragic event. The thousands of pieces of glass falling to the ground when planes ripped through the buildings, SHATTERING windows, was similar to Kristallnacht, The Night of Broken Glass, when German gestapos “shattered” the windows of Jewish businesses in 1938. What I think the 911 attackers wanted to accomplish was the shattering of America’s sense of security and dominance in the world. Their attack was an announcement that they’re able, funded, organized, and highly motivated to carry out their objectives. *Update: The destruction of the Twin Towers might symbolize the Elite’s plan to destroy Man’s double-stranded DNA by adding ‘another’ strand to it, changing it into something other than totally human and destroying God’s image in Mankind . This goes against God’s decree that all flesh is to reproduce after “its own kind” . Share your thoughts by leaving a Comment. I’d love to get a discussion going on this subject. Isa 14:13 For thou hast said in thine heart, I will ascend into heaven, I will exalt my throne above the stars of God: I will sit also upon the mount of the congregation, in the sides of the north: Isa 14:14 I will ascend above the heights of the clouds; I will be like the most High. 1Co 15:39 All flesh is not the same flesh: but there is one kind of flesh of men, another flesh of beasts, another of fishes, and another of birds. 1Co 15:40 There are also celestial bodies, and bodies terrestrial: but the glory of the celestial is one, and the glory of the terrestrial is another.